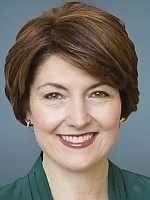 Info Congresswoman Cathy McMorris is serving her first term in the U.S. House of Representatives representing the people of Washington's Fifth Congressional District. In Congress McMorris will work to identify economic opportunities for the Northwest region; improve access to quality, affordable health care; and lead in safeguarding our country against future terrorist attacks. McMorris currently serves on the Armed Services Committee, Resources Committee and the Education and Workforce Committee. She is currently serving as the Freshman Class representative on the Steering Committee and is a member of the Majority Leader's Whip Team. Prior to coming to Congress, McMorris served the people of Eastern Washington as the 7th District Washington State Representative. She was elected by her peers to serve as House Republican leader, the top leadership post in the House Republican Caucus. In Olympia McMorris' legislative work has focused on improving the economy to help businesses succeed, creating jobs for Washington citizens, and improving government through meaningful, common-sense reforms. During her tenure in the legislature she chaired the House Commerce and Labor Committee, the Joint Legislative Audit and Review Committee, and the State Government Committee. McMorris was born and raised on farm and currently lives in Stevens County. McMorris earned her B.A. in pre-law from Pensacola Christian College in Florida and an executive MBA from the University of Washington. She enjoys playing the piano, swimming, and reading biographies. She lives by President Reagan's motto: "There's no limit to what a man can do or where he can go if he doesn't mind who gets the credit." 08/04/2020 WA District 05 - Blanket Primary ?? ?